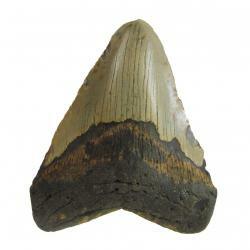 "This gray Megalodon Tooth is in excellent condition. The enamel is in great shape except for a small section near the bourolette. The serrations are complete all along the blade. The root is also in great shape. All in all this is a great buy on an excellent 4 inch tooth. It was found in South Carolina."